Great day of results for North Ayrshire Table Tennis Club at the 3rd Scottish ranking competition of the season, Perth Grand Prix at Bells Sports Centre. 12 North Ayrshire players headed up to compete with a variety of age groups and events on offer to compete in. The U13 Boys event seen 3 North Ayrshire players in the semi finals, with Patric Hollywood overcoming team mate Jamie Johnson, and Chad Duncan narrowly losing out to Glasgow’s Rayyan Khalid 3-2. St Matthews Academy pupil Patric Hollywood put in a fine performance in the final fighting back from 1-0 down and 2-1 down to level at 2 sets all, however, Rayyan kept his cool and won the deciding set 11-7 to claim the title. Martin Johnson justified his top seeding in the U15 Boys event, winning the event without dropping a set. Fresh off the back of his winning British Premier League debut on Saturday, he swept aside no4 seed Harvey McDonald (South Ayrshire) in the semi finals 3-0, and beat Drumchapel Glasgows Zaid Khalid (no2 seed) 3-0 in the final to claim his first Scottish ranking event title of the season. Other notable performances were from Andy Mapherson reached the Quarter Finals of the Mens Singles losing out to Polands Robert Toth 11-7 in the deciding set. 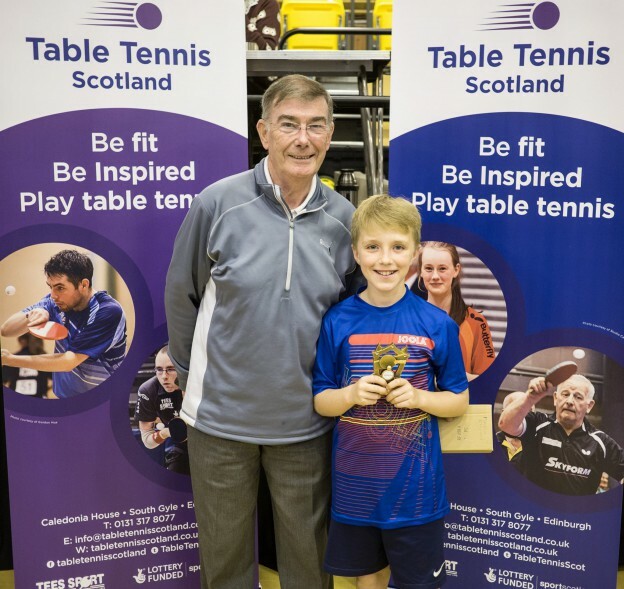 11 year old Jamie Johnson (Martins brother) reached the Quarter Finals of U15 Boys event and Robin Wilson worked his way to the Quarter Finals of the U18 Boys event, with fine wins over higher ranked Aberdeen duo of Joe Cranna and Andrew McCrae. North Ayrshire TTC have just began their new weekly classes schedule starting after the October School Holidays, If anyone of any age is interested in starting or getting back into table tennis, please visit our Facebook Page or our website www.northayrshirettc.co.uk for more information. This entry was posted in Latest News on 18th October 2016 by Chris Main.